Senator Rand Paul (R-KY), who famously filibustered the nomination of CIA Director John Brennan over his position on the use of drones against American citizens, has now apparently done a 180 degree turn on the issue after the Boston Bombing. Earlier this week, on the Neil Cavuto Show on Fox Business Network, Paul apparently sanctioned the use of drones to kill American citizens in the commission of something as simple as a liquor store robbery. At the three minute mark in the video below, Sen. Paul says, "I never argued against any technology being used when you have an imminent threat, an active crime going on. If someone comes out of a liquor store with a weapon and $50 in cash, I don’t care if a drone kills him or policeman kills him.” Really Senator?! This is wrong on so many levels, I am not quite sure where to start. Let's start with listening to his actual words. Please listen to the entire video so you get his message in context. Let's start with the most glaring lack of understanding in Paul's statement. A police office cannot simply shoot a suspect coming out of a liquor store with a gun in his hand. He can only use deadly force against that suspect if there is reasonable belief that the suspect is an imminent threat to the life of the officer or other people nearby. In other words, he can only shoot if he believes the suspect is about to shoot him, or someone else. A suspect can never be an imminent threat to a drone, so how can Paul say there is no difference in the suspect being killed by a drone or by a police officer. Paul's statement seems, on the surface, to be a total trashing of the 5th Amendment of our Constitution which states that no person shall "be deprived of life, liberty, or property, without due process of law..." Does he think that cops, or now drones, should simply be allowed to kill a suspect on site just because they have a gun and might be a threat? Should deadly force from a drone have been used against Christopher Dorner? Then there is the issue of reasonable application of force. There is a huge difference between an officer's use of a handgun, shotgun or rifle vs. the use of the kind of ordinance that would be deployed from an unmanned drone. Talk about collateral damage! Just wait till an unmaned drone launches a rocket to take out a suspect and blows up the building behind the suspect and all its occupants. This issue was discussed this morning on KTRH Radio's Michael Berry Show. A Rand Paul supporter called in and claimed that perhaps Paul was "understating" the kind of threat where it would be okay to use a drone against American citizens. 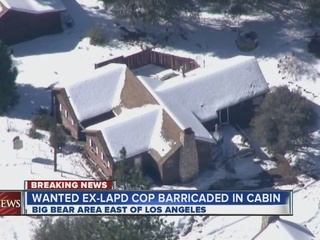 He then went on to discuss the situation where the cop-killer suspect Christopher Dorner was hold up in a cabin in the mountains, surrounded by cops (an event I covered live). He implied that it would be okay in that situation to use a drone to "take out" the suspect. NO! IT IS NOT OKAY FOR DRONES TO BE "TAKING OUT" AMERICAN CITIZENS! It is not the job of law enforcement to execute suspects. They can use deadly force if they are in danger, but the use of deadly force is supposed to be to "stop the threat" not "kill the suspect". 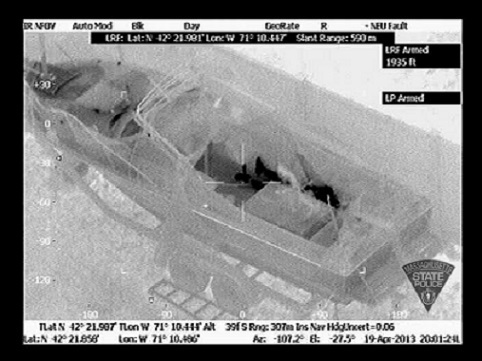 Should deadly force from a drone have been used against Boston Bomber #2? I called Sen. Paul's office today to ask a specific question. I asked the Senator if he would have sanctioned the use of deadly force from a drone against the Boston Bombing Suspect #2 while he was hiding in the boat, potentially with more bombs and other deadly weapons? Most of his offices were not answering the phones today. I contacted his communications director via email and am still awaiting a response to this question. On a conference call with Sen. John Cornyn (R-TX) today, I asked Sen. Cornyn if he would have sanctioned a drone attack on the Boston Bombing Suspect #2 while he was hiding in the boat. Cornyn's answer was a flat "I do not." He went on to explain that the most important thing was for the suspect to be captured alive so he could be questioned and information could be obtained. Sen. Paul does seem to be walking back his statement however. Given the reaction from his supporters, who can be fairly rabid over certain issues from time to time, I can understand why he would seek to do that, but he cannot walk back what he actually said. In a public statement on his official website, Sen. Paul said, "My comments last night left the mistaken impression that my position on drones had changed." "Let me be clear: it has not. Armed drones should not be used in normal crime situations. They may only be considered in extraordinary, lethal situations where there is an ongoing, imminent threat. I described that scenario previously during my Senate filibuster." Again I ask, really Senator? Because that is certainly not the very clear and deliberate statement you made to Cavuto when you said "I don't care if a drone kills him or a policeman kills him." This in reference to a simple liquor store robber. It is hardly an extraordinary situation. It will be interesting to see how Rand Paul's supporters will react to this and if it undermines his potential bid for a White House run in 2016. I think his remarks will cost him the bid for the White House.